If a Song Could Be President? Comments Off on If a Song Could Be President? Last night we had the privilege to join Karin Berquist for her birthday. If that name doesn’t sound familiar maybe you’ll recognize the band that she sings with: Over the Rhine. Her and husband Linford Detweiler, are the very core of the group. OTR has a strong and dedicated following to music that is written from their Christian perspective but more often gets played in bars and clubs! We attended their concert last night at the Music Mill in Indianapolis and were treated to an awesome show with front row seats! (I think the show would have been awesome from any spot in the 250 seat crowd) We also ran into a good friend from Anderson, another Anderson Road Runner, some friends of Christy’s from IWU and spotted Jon McLaughlin. Using an upright bass, cello, ukulele, guitar, drum kit, piano, and even a cookie sheet, they provide an awesome sound that is evocative. They also have a sometime hilarious, sometimes serious, but always fun stage presence. At one point I thought the drummer was going to leap from behind the drum set into the audience, but he was only dramatically grabbing the cymbals! You should check out some of their music. To me one of their funniest and most appropriate songs for 2007-2008 is If a Song Could be President. Thank you Sarah for the tickets! Webster defines a friend as “one attached to another by affection or esteem or a favored companion.” Well I definitely don’t have 326 favored companions, I am a bona fined introvert so that would be way too many friends for me to engage with. Fortunately, for me I am able to maintain my sometimes shallow friendships under this part of the Webster definition: “one that is not hostile or one that is of the same nation, party, or group.” This is how I would characterize most of my friendships on Facebook, Myspace, and LinkedIn, respectively. Whether you realize it or not, social networking is something you do every day. Each time you tell a friend about a good movie, bore a neighbor with pictures from your kid’s birthday party or catch up on gossip at work, you are reaching out to people you know to share ideas, experiences and information. The genius of social-networking websites such as MySpace and Facebook lies in their ability to capture the essence of these informal exchanges and distill them online into an expanding matrix of searchable, linked Web pages. A local newspaper wrote an article shortly after TIME’s which explored some of the consequences of this boom. It’s common for users to create “real” friendships out of their virtual ones. For example, one person will see another is planning to attend a concert of a band they both like and ask to go along. Before long, they’re hanging out regularly. Jeff Bardzell, a professor at IU’s School of Informatics who teaches human-computer interaction, disagrees. As someone who uses and studies networking sites and interactive online games such as Second Life, he has used the technology to reconnect with high school friends and keep up long-distance relationships. Rather than substituting for conventional friendships, Bardzell, 37, said digital tools are a way of maintaining “loose connections” that might otherwise wither and die. Browsing through my list there are people that I never would have heard from again after high school, college, summer camp, or whatever. This has provided a way to stay connected and have a “relationship” for the long haul. Who knows when our paths might cross again. A friend from college that I lost touch with lives in Minneapolis and we are going to connect when I move there. I would never have known that without Facebook. I also use it to stay in touch with and keep tabs on what kids I work with at church are really thinking and doing. This can be good and bad! Stalking can be taken to a different, more passive level, which isn’t a good thing. We all must understand the boundaries and realities of what we are posting. Christians have been urging retail outlets to put “Christ back in Christmas” and to “Remember the Reason for the Season.” Now you can step back in rejoice in our success!! The $15 Talking Jesus action figure is pretty much sold out at Wal-Mart according to the Consumerist. 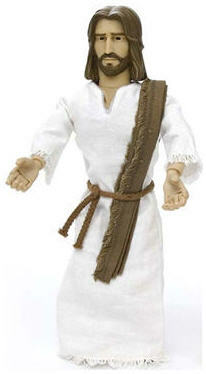 The action figure may still be available at Target, so you still have a chance to put Jesus under the tree! This action figure was first reported on by the Consumerist in October. At that time Wal-Mart was taking a risk that the figurines would sell and it seems to have paid off! “We sold out at Wal-Mart, and the toys are still available in a very limited supply at Target.com,” said spokesman Joshua Livingston. The company won’t restock again before Christmas. The company who makes talking Jesus is one2believe which promotes Bible Based Toys for Children. The company has a marketing campaign called “Battle for the Toy Box” through which they are promoting their faith-based toys to the faith community. To me this kind of goes against the Second Commandment of not making “an idol or an image of anything in the heavens.” I know we have taken great liberty throughout the years with that verse, so I guess we should be excited that these products sold so well in a “secular” market, since “Faith-based dolls are nothing new in Christian stores” according to an article in the Des Moines Register. 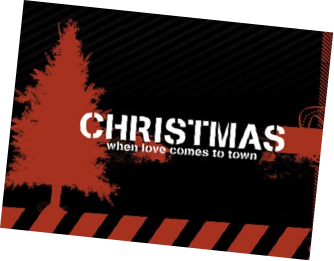 What do you think about Talking Jesus and literally putting Christ in Christmas? Comments Off on Perspectives Countdown: 4 Weeks! In exactly four weeks fellow Christians will begin the 15 week journey to learn what God has done and is doing around the world! PRAY FOR THE COURSE — STARTING TODAY!! Contact Diane or other task force members if you’d like more information about getting involved. Remember that Alumni are allowed to visit any week for free! Also if you are on Facebook join our group! Vertigo is Coming to Town! Christians should not be doormats. Too often Christians get depicted as “pushovers” or “weak” but we are not to be doormats. Lots of professional athletes help dispel this image to a degree, but what does it really mean to make oneself meek and humble? I know for me servant and slave are not words that I readily identify with. Like Chris I have always read this passage and thought that to become a leader or first I must be a servant and slowly work my way up in an organization or group. I don’t think this is completely incorrect, but Chris provided an alternate idea that really got me thinking. In our society by being a servant and serving the needs of others we are being leaders of Christ’s kingdom, spreading His love. Chris explains it much better than I, but basically the way we think about leadership and power is focused on the world, but when Christ thinks about leadership and power it is on a very different plane (one that we would think of as low). Christ came to invert the world or to use the language from the message: Vertigo. Vertigo is when our surroundings seem to whirl dizzily! Christ’s perspective can seem so different than ours that is whirls by us without ever truly understanding. Christ was known by His love. What are you known by? This is the famous tombstone or epitaph question. Christ doesn’t want us to be a doormat, but does want us to love others as He loved. He doesn’t want us to feel the shame that comes with being lowly but the joy that comes through loving service. Another main point of the message was that we are called to give everything. Many of us rationalize that when we “make it” or make our first million we’ll give a substantial amount to the church or missions. That’s not what Christ wants, if the widow had waited to give 5 mites instead of her 2, she might never have been able to do it. We are asked to remember that God has blessed us and we should give back to Him and honor Him now. The first occurred at 12:30am at a YWAM (Youth with a Mission) training facility in a Denver suburb. A man walked into the center, asked for housing, and when told that wasn’t possible pulled a gun and shot 4 people. Two died during surgery while the other two continue to recover. The suspect is still on the loose. The second shooting occurred around 1pm in the parking lot at New Life Church in Colorado Springs. Associate Pastor Rob Brendle and the local police disagree on some of the specifics but several people were injured, including the suspect. The police say 3-5 were injured, the hospital hasn’t given a specific number. The police state that no one was killed. A pipe bomb was also found at the church. New Life was in the news in 2006 when its founder Ted Haggard resigned. Evening services were canceled. Adventures and Thoughts of Team Cross is powered by	WordPress 4.3.19 and delivered to you in 0.501 seconds using 33 queries.